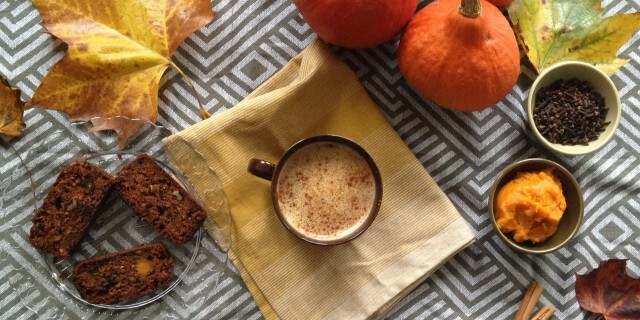 This Pumpkin Chai Latte makes you want to snuggle up in a warm blanket on a chilly fall evening. It’s rich and warming. Just what you need to warm up as the temperature outside is dropping and the streets are covered in a blanket of fall leaves in such an amazing variety of colours. I love the smell of fall in the air and I love those brightly coloured leaves, from buttery yellow to rusty orange and deep burgundy red. This Pumpkin Chai Latte looks like fall and tastes like fall. It’s so easy to make. It’s sweet, nourishing and utterly delicious. It’s the perfect the drink when coming home from a long stroll outside in the park or after a long day at work. I love fall but I really hate being cold. When I have been outside on a cold day, it often takes me quite a while to warm up. When you notice you are turning up the heat at home or you find yourself reaching for an extra sweater, go make yourself a nice Pumpkin Chai Latte. Drinking it is like turning up the heater inside. Your blood starts to flow, energy rushes back into your body and you are transported into a different world almost instantly. Even if you don’t own a fire place, you can easily imagine yourself sitting at a warm fireplace, all cosied up, wrapped up in warm blanket. Nothing beats making your own Pumpkin Chai Latte. I have used fresh pumpkin puree in this Pumpkin Chai Latte, which does take more time. It’s definitely worth it and you can use the left-over pumpkin puree to make soup or pumpkin bread. If you run out of time though, you can also used canned (unsweetened) pumpkin puree. If you can’t find pumpkin puree in your local store, simply make your own. Buy a medium-sized sugar pumpkin. Cut it in half, remove seeds and wrap the pumpkin halves in alu foil. Place the pumpkins halves (open side up) on a non-grease baking tray in a preheated over at 165 degrees Celsius for one hour. When soft and tender, scoop out the pumpkin flesh and puree it in a blender, until you have a smooth consistency. Enjoy! For the Chai tea, add 2 Chai tea bags to one cup of boiled water. Allow to infuse for 10 minutes or even longer for a strong flavor. I like to use this brand. Add the almond milk, chai tea and coconut palm sugar to a pot. Bring up to a simmer and stir until the coconut sugar is completely dissolved. Add the spice mix, vanilla and pumpkin puree. Whisk until the pumpkin puree is dissolved and the mixture has a foamy texture. Take off heat, and serve with cinnamon or nutmeg sprinkled on top.